Enjoying ‘the artwork’ before seeing ‘the artist’ is a powerful way to challenge our expectations, when it comes to disability art. When you hear the phrase ‘Disability Art’, what’s the first thing that comes to mind? What kind of paintings and photos do you envisage? What materials are used and how does it make you feel? Like everything, we bring our past experiences and perceptions to our mindset. This is, in part, why the artists that attend art programs at Options decided to have a professional exhibition – to challenge some of these preconceived ideas. 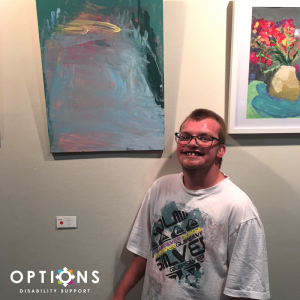 Over the course of the last year the art students from OPTIONS have visited galleries, explored different art practices, looked at historical artists and discussed artworks. Through these discoveries and through talking with their art facilitator, Kimberley, they decided that they wanted to strive for an exhibition that would show the community the work they were producing as artists. Designed to ‘Challenge ideas and perceptions in ability and art’, the ‘SHIFT’ exhibition took months of work and planning. Fundamental to the project were the principles that it be a professionally curated exhibition, in a public space, with an opening night and with all artworks for sale. These concepts were both daunting and exciting for the artists and their families. Kimberley says “our artists committed very early on to developing their professional practice and techniques through feedback and collaboration, resulting in improved skills and impressive pieces for the exhibit”. As well as external curation, self-critique played a part in the selection process and pushed these artists to strive for their best outcomes. It was crucial to them that they be afforded the same standards of exhibiting as other artists. Art has always done this – shone a light on differences and diversity, as well as challenging us to think. 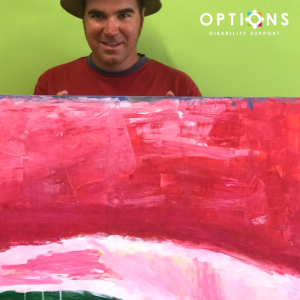 Having the support to produce, professionally display and exhibit their art has meant these artists have been able to take their place within the artistic community, identify as artists and bring joy to the world through their creations. Shifting a few perceptions along the way.